For the Hilbert space-filling curve, see Hilbert curve. 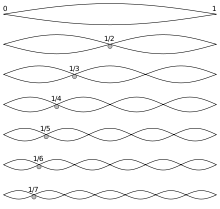 Hilbert spaces can be used to study the harmonics of vibrating strings. A Hilbert space is a mathematical concept covering the extra-dimensional use of Euclidean space—i.e., a space with more than three dimensions. A Hilbert space uses the mathematics of two and three dimensions to try and describe what happens in greater than three dimensions. It is named after David Hilbert. Vector algebra and calculus are methods normally used in the two-dimensional Euclidean plane and three-dimensional space. In Hilbert spaces, these methods can be used with any finite or infinite number of dimensions. A Hilbert space is a vector space that has the structure of an inner product that allows length and angle to be measured. Hilbert spaces also have to be complete, which means that enough limits have to exist for calculus to work. The earliest Hilbert spaces were studied in the first decade of the 20th century by David Hilbert, Erhard Schmidt, and Frigyes Riesz. John von Neumann first came up with the name "Hilbert Space". Hilbert space methods made a big difference to functional analysis. Hilbert spaces show up a lot in mathematics, physics, and engineering, often as infinite-dimensional function spaces. They are especially useful for studying partial differential equations, quantum mechanics, Fourier analysis (which includes signal processing and heat transfer). Hilbert spaces are used in ergodic theory which is the mathematical basis of thermodynamics. All normal Euclidean spaces are also Hilbert spaces. Other examples of Hilbert spaces include spaces of square-integrable functions, spaces of sequences, Sobolev spaces made up of generalized functions, and Hardy spaces of holomorphic functions. Bers, Lipman; John, Fritz; Schechter, Martin (1981), Partial differential equations, American Mathematical Society, ISBN 0821800493 . Bourbaki, Nicolas (1986), Spectral theories, Elements of mathematics, Berlin: Springer-Verlag, ISBN 0201007673 . Bourbaki, Nicolas (1987), Topological vector spaces, Elements of mathematics, Berlin: Springer-Verlag, ISBN 978-3540136279 . Boyer, Carl Benjamin; Merzbach, Uta C (1991), A History of Mathematics (2nd ed. ), John Wiley & Sons, Inc., ISBN 0-471-54397-7 . Brenner, S.; Scott, R. L. (2005), The Mathematical Theory of Finite Element Methods (2nd ed. ), Springer, ISBN 0-3879-5451-1 . Clarkson, J. A. (1936), "Uniformly convex spaces", Trans. Amer. Math. Soc., 40 (3): 396–414, doi:10.2307/1989630, JSTOR 1989630 . Dirac, P.A.M. (1930), The Principles of Quantum Mechanics, Oxford: Clarendon Press . Folland, Gerald B. (2009), Fourier analysis and its application (Reprint of Wadsworth and Brooks/Cole 1992 ed. ), American Mathematical Society Bookstore, ISBN 0821847902 . Fréchet, Maurice (1907), "Sur les ensembles de fonctions et les opérations linéaires", C. R. Acad. Sci. Paris, 144: 1414–1416 . Halmos, Paul (1982), A Hilbert Space Problem Book, Springer-Verlag, ISBN 0387906851 . Hilbert, David; Nordheim, Lothar (Wolfgang); von Neumann, John (1927), "Über die Grundlagen der Quantenmechanik", Mathematische Annalen, 98: 1–30, doi:10.1007/BF01451579 . Kac, Mark (1966), "Can one hear the shape of a drum? ", American Mathematical Monthly, 73 (4, part 2): 1–23, doi:10.2307/2313748, JSTOR 2313748 . Kakutani, Shizuo (1939), "Some characterizations of Euclidean space", Jap. J. Math., 16: 93–97, MR 0000895 . Kline, Morris (1972), Mathematical thought from ancient to modern times, Volume 3 (3rd ed. ), Oxford University Press (published 1990), ISBN 978-0195061376 . Kolmogorov, Andrey; Fomin, Sergei V. (1970), Introductory Real Analysis (Revised English edition, trans. by Richard A. Silverman (1975) ed. ), Dover Press, ISBN 0-486-61226-0 . Lanczos, Cornelius (1988), Applied analysis (Reprint of 1956 Prentice-Hall ed. ), Dover Publications, ISBN 048665656X . Lindenstrauss, J.; Tzafriri, L. (1971), "On the complemented subspaces problem", Israel Journal of Mathematics, 9 (2): 263–269, doi:10.1007/BF02771592, ISSN 0021-2172, MR 0276734 . O'Connor, John J.; Robertson, Edmund F. (1996), "Abstract linear spaces", MacTutor History of Mathematics archive, University of St Andrews ..
B.M. Levitan (2001), "Hilbert space", in Hazewinkel, Michiel, Encyclopedia of Mathematics, Springer, ISBN 978-1-55608-010-4 . Prugovečki, Eduard (1981), Quantum mechanics in Hilbert space (2nd ed. ), Dover (published 2006), ISBN 978-0486453279 . Reed, Michael; Simon, Barry (1975), Fourier Analysis, Self-Adjointness, Methods of Modern Mathematical Physics, Academic Press, ISBN 0-12-5850002-6 Check |isbn= value: length (help) . Riesz, Frigyes (1907), "Sur une espèce de Géométrie analytique des systèmes de fonctions sommables", C. R. Acad. Sci. Paris, 144: 1409–1411 . Riesz, Frigyes (1934), "Zur Theorie des Hilbertschen Raumes", Acta Sci. Math. Szeged, 7: 34–38 . Saks, Stanisław (2005), Theory of the integral (2nd Dover ed. ), Dover, ISBN 978-0486446486 ; originally published Monografje Matematyczne, vol. 7, Warszawa, 1937. Schmidt, Erhard (1908), "Über die Auflösung linearer Gleichungen mit unendlich vielen Unbekannten", Rend. Circ. Mat. Palermo, 25: 63–77, doi:10.1007/BF03029116 . Sobrino, Luis (1996), Elements of non-relativistic quantum mechanics, River Edge, NJ: World Scientific Publishing Co. Inc., ISBN 9789810223861, MR 1626401 . Stewart, James (2006), Calculus: Concepts and Contexts (3rd ed. ), Thomson/Brooks/Cole . von Neumann, John (1929), "Allgemeine Eigenwerttheorie Hermitescher Funktionaloperatoren", Mathematische Annalen, 102: 49–131, doi:10.1007/BF01782338 . von Neumann, John (1932), "Physical Applications of the Ergodic Hypothesis", Proc Natl Acad Sci USA, 18 (3): 263–266, Bibcode:1932PNAS...18..263N, doi:10.1073/pnas.18.3.263, JSTOR 86260, PMC 1076204, PMID 16587674 .
von Neumann, John (1955), Mathematical foundations of quantum mechanics, Princeton Landmarks in Mathematics, Princeton University Press (published 1996), ISBN 978-0-691-02893-4, MR 1435976 . Weyl, Hermann (1931), The Theory of Groups and Quantum Mechanics (English 1950 ed. ), Dover Press, ISBN 0-486-60269-9 . This page was last changed on 24 January 2019, at 04:34.